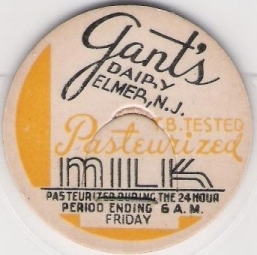 The photo on the left shows a milk bottle top from Gant’s Dairy in Elmer, NJ. The bottle top was probably made from cardboard and is thought to date from either the 1950s or 1960s. The 1840 tithe map valued by William Beck of Mileham and John Beck of Longham shows what are now known as Litchfield Cottages owned by William Gant and rented to William Bell and another. What is now Grenstein Farm is called ‘Beck’s Farm’. Eastview is owned by Richard Gant and rented to William Bird and others. The pightle (parcel of land) is owned by Mary Griggs and used by Richard Gant and Charles Alby. Richard Gant also uses Neatherd land, Holly Field, Graver’s bungalow field as well as owning Baines farm and land at Beeston. William Gant owns fields at Beeston and the last house in the village opposite the chalet. A working watermill. The mill’s history dates back to the Domesday survey of 1068, which listed two watermills in Pitcombe, next to Bruton. They were worth 20 shillings. One of these was almost certainly the site of Gants Mill. The earliest document tells of a John le Gaunt, after whom the mill is still named. In 1290 the Lord of Castle Cary granted him the right to build a fulling mill here. See http://www.gantsmill.co.uk for the full history. John Fulloner of Lullington (with the consent of Cristina his wife), to John Le Gant of Briwton, of a fulling mill at Cumb’ juxta Briwton, etc., which Andrew onetime lord of la Cumb’ granted to his father Roger Fulloner of Lullington at annual rent of a rose and 10s. Witn: Ralph Hurscarl; Will. de Godmaneston’; Thom. de Cumba; Will de Compo Florido; Henr. de Harvile; Nich. Le Poer; Joh. de Wik’. Gantesgrave appears as early as 1291. The name probably originates from Richard le Gant, who is recorded as living in the area in 1285. In 1321 Ralph le Gant was steward of Barking Abbey, and Richard and Gilbert le Gant were stewards in 1456. The historic buildings in the Quakers Friars area of Bristol, now being redeveloped as part of the Broadmead “improvement” scheme at Cabot Circus, will remain as a reminder of the city’s religious past. The Dominican – or Black Friary as it was known – was founded by Matthew de Gourney and Maurice de Gant, the son of Robert de Berkeley, in about 1227. A deed dated 7th and 8th Feb. 1669, describes a ‘Meeting House, Burial Ground, and Premises at the Friars’ as: “Occupying part of the site of the ancient monastery of the Black Friars (who used the present Burial Ground) situate between Rosemary Street and the Broad Weir, from each side of which there is an entrance.” The former Meeting House was sold in 1956 and became Bristol Register Office, and the burial ground was exhumed and became largely used for car parking. The page to the left is an extract from the book “Abstracts and Extracts of Smyth’s Lives of the Berkeley Family” by Thomas Dudley Fosbroke & John Smyth, published 1821. 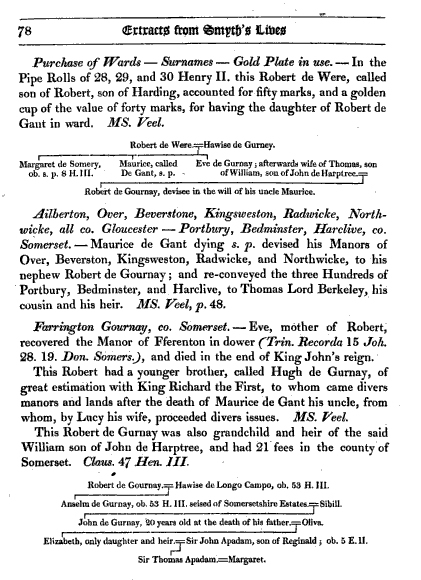 “Maurice de GANT dying s. p. devised his Manors of Over, Beverston, Kingsweston, Radwicke, and Northwicke, to his nephew Robert de Gournay; and re-conveyed the three Hundreds of Portbury, Bedminster, and Harclive, to Thomas Lord Berkeley, his cousin and his heir”. Robert FitzHarding acquired the adjacent hundreds of Bedminster, Portbury and Hartcliff and granted them to his younger son Robert, but Thomas (I) Lord Berkeley (d. 1243) bought the reversion from Robert’s son and heir Maurice de Gant. Portbury hundred was entailed in tail male, along with the manor, by Thomas (III), but Bedminster and Hartcliff hundreds, possibly because they were settled in jointure and tail general in 1289 with the manor of Bedminster, were not. Consequently, on the death of Thomas (IV) in 1417, Bedminster and Hartcliff hundreds passed to his daughter, the countess of Warwick. Thomas de Berkeley and Maurice de Gant. n.d.
Thomas has inspected the grant by Robert, his grandfather, to Robert his [Robert’s] son of the three hundreds which the earl of Gloucester gave him, viz. those of Portbury, Bedmunistre and Hareclive, to hold of him [Robert] for a rent of 1 mark a year, and confirms it to Maurice de Gant. Robert FitzHarding’s son Maurice (de Gant), 2nd Lord Berkeley (d. 1190) known as Make-peace because of his diplomatically astute marriage with the daughter of the former occupier Roger de Berkeley (in order to settle the inheritance) has left his mark on the Castle by adding a tower or forebuilding opposite the Keep, also the curtain walls of the inner and outer courtyards. He evidently made the Castle his home, in the sense that his predecessors had never done. His son Robert temporarily lost possession of his property as a result of siding with the barons at Runnymede when King John was compelled to sign Magna Carta; it was restored to the Berkeleys in 1233.